Port wine also called Porto de vinho or simply Porto is a sweet wine which comes from Portugal. AZ boutique features a broad range of port glasses which are are specially designed to meet the requirements of professionals in the catering industry, hotels and individuals! 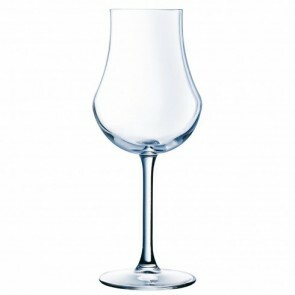 You will find famous port wine glass brands such as Chef & Sommelier or Arcoroc. The port glass: a perfect shape and capacity to enhance aromas! Any connoisseur will tell you that the shape, material and capacity of a good porto glass must allow to lift up each single aroma. This wine has a dedicated glass; Port glass! This transparent glass is special because it releases the aromas of wine thanks to its shape and its particular design. Although this type of wine "can" be consumed in a tulip-shaped or in a liquor glass, port wine is actually the ideal type of glass for tasting Port wine! Made of glass or crystalline glass with a unique shape which allows you to warm the spirits with the palm of your hand, porto glass is ideal for highlight the rich fruit flavors and sweetness of this wine and allow you to smell the powerful scent of port! Famous worldwide in the twenty-first century, port wine is an exceptional blend of several grape varieties from the Haut Douro region, about 100 kilometers from the city of Porto in Portugal (which accounts for the name of this dessert wine. During the fermentation process where the alcohol is boosted, brandy is also added to the beverage to keep some sweetness and roundness! This mixing process must be done neither too early nor too late and once this process is finished, the wine is bottled and stored in a cellar to ‘age’. The wine will hence develop opulent aromas. Port wine has become a reference in the world of wines as well: some Port wines such as Port Vintage have as much prestige as a bottle of red wine such as Burgundy or Bordeaux wine. Since brandy is added during its manufacture, Port wine is considered as a fortified wine. For an optimum tasting experience, the wine service must follow some strict rules not to mention the importance of food and wine pairing! There are some cardinal rules to follow for matching up food and porto. Bear in mind that there are different types of port wines and therefore different possible wine pairings. Ruby Port or "Late Bottled Vintage" are young red wines with a delicate sweeter style and will be the perfect pair desserts having a note of sourness such blackcurrant pie or a lime cheesecake. The "Tawny"port, which is a red wine with a caramelized which can be paired with a cheese to obtain a perfect contrast between sweet and savory, with a nutty dessert or a foie gras appetizer. The port called "Vintage" is considered as the holy graal of porto meanwhile since it comes from only top-quality grapes of an exceptional year. It is bottled after two years of setting in barrel or lightning and continues to improve and age in the bottle. This vintage with a full-bodied flavor is certainly the most appreciated port and appreciated on its own. To better appreciate this great vintage, it will be necessary to use a decanter and serve it in a carafe to air and oxygenate it. It can also be enjoyed with blue cheese and dried fruit. White port is another type of appreciated port wine with a similar manufacturing process b from white grape varieties. It is drunk cool as an appetizer, with some ice cubes. You can even make beautiful white port cocktails in our dedicated glasses to toast with your guests. AZ boutique features a broad range of professional port glasses which are are specially designed to meet the requirements of the catering industry, restaurants, hotels and individuals! Discover our port wine glass brands including Chef & Sommelier or Arcoroc exuding timeless elegance with a touch of modernity! You will also find our collection of glasses made in krysta for impeccable shiny finishes and higher scratch resistance. Discover AZ boutique’s amazing glassware selection including other appetizer and cocktail glasses such as beer glass, aniseed glass, whiskey glasses, brandy glass/liqueur glass, champagne glasses, shooter, Martini glasses, or longdrink glasses as well as elegant wine glasses for red wine, white wine glass and wine tasting glasses.